If you are residing in the European countries or you had any chance of traveling through these countries then you might have noticed that one of the most observed of the latest bathroom trends is the installation of bathroom bidets in the modern bathrooms as well as the traditional ones. The bidets are though used for the purposes as those of the toilets but apparently they look like the basins as they have water fixtures and small drainage like the washbasins. Apart from being used as a toilet, bidets are also used by many people to wash their feet and legs. 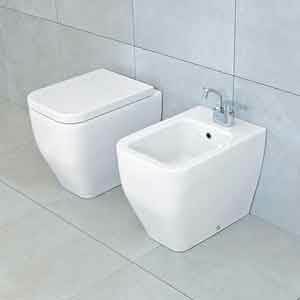 Following the current European bathroom trends, Banyo has a vast range of bathroom bidets in stock from back to wall bidets to floorstanding bidets also including wall-hung bidets. These ranges of bathroom bidets are crafted by the top-ranked and world renowned international bathroom brands and are offered at the best reasonable prices. Available options: 1 Tap Hole Bidet. Dimensions: Height: 315mm x Width: 540mm x Length: 350mm.